Petr Bambousek | Wildlife Photography | Behind the lens – Thailand II. Behind the Lens - Thailand II. Behind the lens – Thailand II. 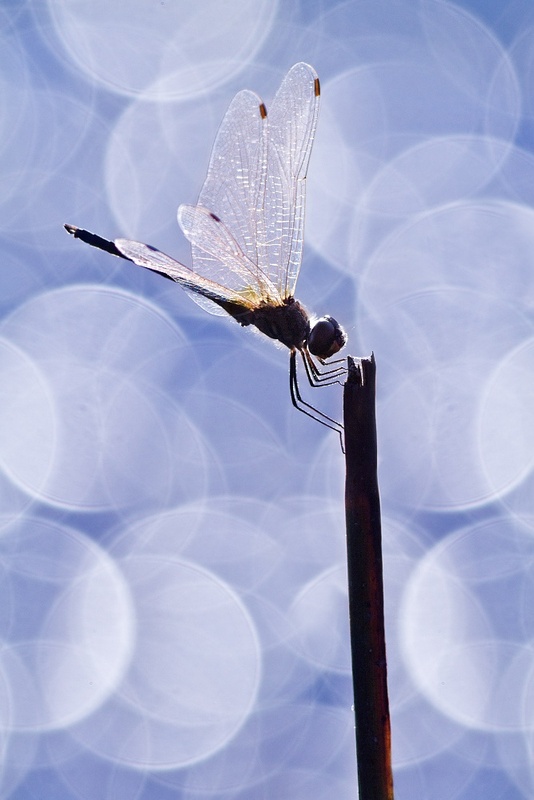 If there is anyone with an incurable weakness for dragonflies than he should go to Thailand. I think we saw easily over 20 different species that would group in really large numbers. One day though, it was almost dusk when I was walking by a small pond and to my surprise there was no dragonfly in sight. I was ready to call it a day when I noticed a rather large one resting on a piece of stick. I had a 400mm lens with an extension tube. I pointed at her and wanted to see what she would look like. Well, like a dragonfly on a stick. Carefully, I bypassed her to view her from a different angle against the light and I quite liked the resulting silhouette. As I was roaming around with my lens I noticed some flowering aquatic plants floating on the surface of the pond creating typical duckweed. Under a certain angle I could see glittering raindrops hiding among the duckweed. I knew that this would be ideal as a perfect background. What I didn’t know though, was how to get it in the same angle with the dragonfly. From my experience with Czech insects I knew that if I touch it with something “nature-ish” as opposed to with my hands, they are much more relaxed. This way, I was able to transfer any insect with twigs or straws or other things I had at hand. Lucky for me, this exact technique worked for Thai insect too. I offered her a half a meter long straw that she accepted with no hesitation and moved over. From there I managed to transfer her over to a twig perfectly positioned in front of the glittering duckweed and Bob’s your uncle. When in Thailand I experimented with long exposure shots. On one wetland near Bangkok I saw a huge flock of black-tailed godwits. Unfortunately, they were all so far away from me that it was pretty much useless to even attempt shooting them. 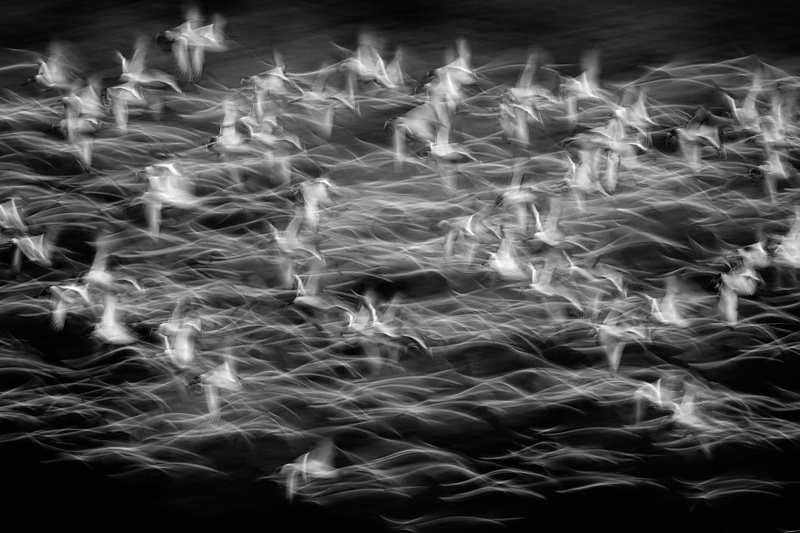 I have always been fascinated by large flocks of birds so I at least videoed them. A moment later the entire flock of countless of birds flew away and I was deafened by the flapping of their wings. They would fly there and back and after a while they landed back on the lagoon to start their festivities. It was mesmerising. I wanted to photograph a similar type of shot many years back somewhere else but for some reason I never got to it. Now, it was right in front of me. Resigning on a shot of a single bird I decided on photographing a flying flock. And so I waited for their move. It lasted more than 20 minutes before the flock would get airborne again for 30 seconds. The shutter kept clicking and I even managed to fiddle with the time setting to achieve different effects. In the end, I created a series of about 50 shots. Only one of which, though, I wanted to select for a web (so that it doesn’t get too boring for a viewer) and that was the hard part. Every one of the daubs has a little something, but the one below speaks to me the most. By converting it into B&W it became even more abstract and I consider it one of the most outstanding photos from my Thai trip. Half a year later the photo was awarded a Sony World Photography Award. Sadly, one thing I couldn’t get the hang of in Thailand, was photographing butterflies. And that is something, even though – despite being there out of butterfly season – I have never seen that many swallowtails or peacock butterflies in my life. On places with rich moist sand, I could often see several tens of them squeezed in minimal huddles to extract maximum minerals these places provided. Unfortunately, a photo of a butterfly on sand is just another lifeless photograph of a butterfly on sand. Another option was to shoot them close to a flower. However even that wasn’t to my liking. The butterflies would either drunk the nectar whilst still fluttering their wings or would rest and instantly closed their wings. Aesthetically, shooting them was a little enigma for me. To top it off, most tropical butterflies have one huge disadvantage for photographers, that after closing their wings they look like a dry lifeless leaf. To sum up, it’s a spectacle to look at them but a mystery to shoot. 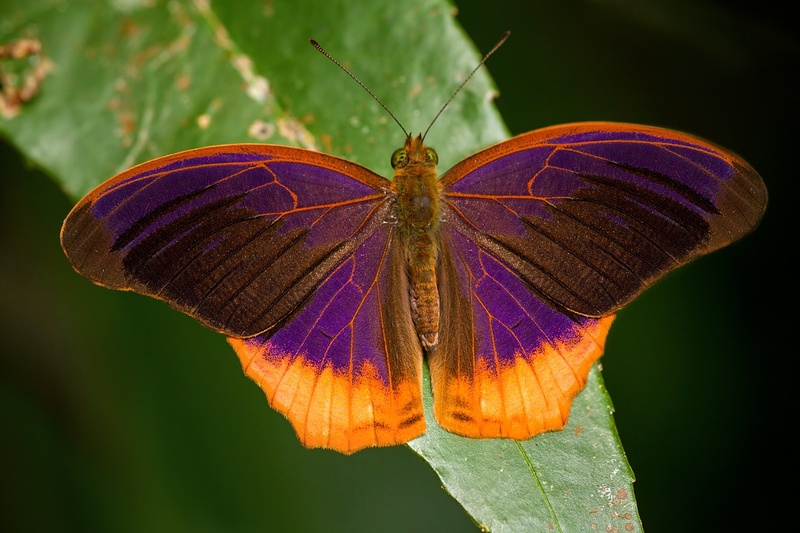 In fact, the butterflies really love sunshine and are the most active when it’s shining at its best. In one instance just when this magnificent butterfly was fluttering beside me, the sun hid behind a cloud. Panicking that the sun is gone, the butterfly would sit on a leaf not far away from me and shut his wings. In the meantime, the sun started slowly to peak from behind the cloud and the butterfly would slowly open his wings. All in all, that lasted about 2 seconds before he’d again flutter happily away. Lucky for me, in the hope that these fleeing 2 seconds will happen, I had time to point my camera at him and press the shutter button.